Used Audi A8 Review - 2003-2010 | What Car? 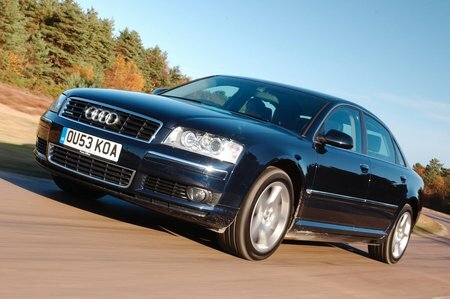 What's the used Audi A8 saloon like? The Audi A8 is a huge saloon that has much to offer anyone in search of a luxury motor that isn't a BMW, Mercedes or Jaguar. The innovative aluminium body means it's lighter than many rivals, helping performance and economy. Four-wheel drive is fitted to most, as is air suspension, offering a choice between four settings. The interior is vast throughout, while the boot offers more than ample space. The long-wheelbase version is rare but brings even more space in the rear seats. It's a very well-built car and the quality of the materials used matches, and sometimes beats, the competition's. Even the cheapest models drive well, feeling smaller than they look, while the high-performance models are seriously quick. The diesels are state-of-the-art but the smaller petrols are accomplished, too. There simply isn't any road noise and, while you'll hear some wind noise, it's completely silent otherwise.